Air conditioners are an easy to install and effective way to lower the temperature of a single room in your home. They work by removing the heat and expelling it out of the room. This differs from ordinary fans, which only move the hot air around the room. They operate until the temperature in the room reaches the desired degree, and then they often turn themselves off, operating again if the temperature rises again. Most only require an electrical supply plus external ventilation. This can be via a hose either placed outside a window, or through a vent in the wall. They are ideal if a central air conditioning system is not a practical solution, or if you will only want to cool one room at a time as opposed to the whole house. An appliance which will create the perfect conditions in your home, this AEG model can tackle any issues to boost your climate. You can either control everything fully by yourself or leave it up to the appliance to best determine what needs to be done. It can automatically sense the temperatures and conditions to change the fan speed. This will keep you comfortable without having to constantly adjust everything. Because of the size, it is perfect for moving around the house and cooling down the rooms as it goes. It can also be used all year round, as it can even make your home warm when winter temperatures hit or dehumidify a muggy environment. When you are watching a movie and don’t want to miss a scene, you can use the remote to turn the appliance off or change the settings, so you don’t have to move. An LCD display will let you know which temperature it is aiming to get your room down to. Lights will also let you know which settings it is currently working to. There is also a sleep option, a timer, a swing option to cover a wider area and a warning light which will let you know when the filter needs clearing or replacing. It may be pricier than AEG’s other options out there. But it combines so many various products all into one device which is perfect if your home is constantly facing all of the climate issues throughout the year. It is also rated A for energy efficiency, so once it has been purchased, running costs are going to be low. Worth it for a more comfortable atmosphere. While air conditioners aren’t bought for their fancy style and aesthetic purposes, for some people it may still be nice to have a model which isn’t bulky and ugly to look at. This model doesn’t only look the part, but it performs too. 1000W of power noticeably drops the temperature in the room, and there are three speeds as well so you can always leave it ticking over to maintain the coolness. Like the pressure to be taken off a little? With auto-mode, the temperature will automatically be monitored, so the fan speed is adjusted to suit without you having to lift a finger. You can even control it when you are in the supermarket or on the train home from work thanks to the Wi-Fi capability, which lets you make adjustments to keep everything perfect for when you get home. You also get a dehumidify setting as a bonus, so if it is so stuffy in your home that condensation is starting to build up, you can give this option a boost for a few minutes and then switch back once everything is clear. It is at the very high-end of the price scale, but it does look great. And it is packed with features which make it the perfect accompaniment to helping your home atmosphere and keeping things ticking over comfortably. Even on the hottest days (as rare as they can be), the 1000W output from this handy air conditioner can cool your room right down. This doesn’t come at a price though, as the A energy rating makes it a very efficient appliance when it comes to cost. There are three speeds to choose from so whether you need a little breeze or a complete wind tunnel, you have the choice at your fingertips. If you need the cool air, but you also need a dehumidifier to rid the room of excess moisture, then the dedicated mode will have you covered. This saves you having to purchase and store two separate appliances. A remote control will let you switch between modes and also boost the power if need be. It is perfect for any rooms up to 18 m³, and the timer function will allow you to safely keep it running overnight or get it going before you arrive home from work. There are two filters which you need to regularly clean with water and dry fully, and at the back, there are two water tanks which will need emptying if using the dehumidifier setting. Other than that, it is hassle-free and simple. A good 4-in-1 product if you want to spend your money on an item which can not only cool the room in summer but also heat it in winter. On top of this, there is a humidifier/air purifier function, which can tackle that stuffy, muggy feeling and also rid the room of any pollutants and allergens. This makes it a great all-rounder for getting your room in perfect condition. An alarm will let you know when the water is running low, so you can top it up – no need to keep checking on it every 15 minutes or risk it all going wrong. A 7.5-hour timer can also be set, which is ideal if you want something overnight but don’t want to worry about it being left on as you dash out for work, or if you want it to come on for a few hours before you get home. There is also a sleep mode, so you can set it to boost its cooling power until it gets down to a reasonable temperature, and then only turn on again when it is needed. It will make an impact in rooms up to 15m2, and if there are windows which can be opened to prevent humidity building up when used as air con. We will, however, say that if it is primarily an air conditioner you are after, then this isn’t actually the strongest function with this model. Cooling is what it is best at, especially if you use cold water and ice to get it going. Still, the multi-use function will come in handy for anyone just wanting something to tide them over. It can be bought for slightly less without the heating function too. If your main priority is to keep your bedroom cool when you are trying to get a good night’s sleep, the technology packed into this machine will do the trick. There is a sleep mode, which is pretty clever. It basically means the unit slowly increases cooling power for the first two hours of use, then stays at the same temperature for five hours before switching off. So, it works hard to reduce the temperature then maintains it for optimum comfort. Plus it keeps running costs lower. It will recycle the condensate water into the condenser, so you don’t have to empty it every ten minutes if it is working on overload. The water actually plays a part in cooling the room, which is perfect if you hate waste. The hose is on the shorter side, and it isn’t the quietest when running so even though it is great for anyone who needs it when sleeping, it isn’t for you if you’re easily disturbed. But it does get temperatures down around 10 °C in around an hour, so there is no denying the flaws may be worth it. 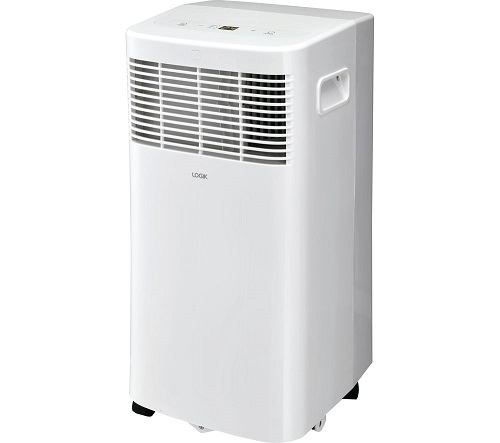 Able to get your rooms cool and fresh in moments, this air conditioner is ideal if you want something on the more compact side but still packing plenty of power. There is a 24-hour timer, and you can set it to switch on and off automatically. This will keep your room cool when it is needed, turning off during the in-between times, saving you energy use. An auto-swing function disperses the air throughout the entire room as well, so you can really feel the benefit wherever you are. Should anything go wrong, the air conditioner can detect this before it causes any issues, turning itself off and displaying the correct error code. When the technician comes to repair it, they will know exactly what happened. If there is a power cut, the appliance will remember the previous settings, so it can pick up where it left off. It has an A energy rating, so won’t cost an excessive amount to run. You get a remote with it so you can alter the power when you’re settled on the sofa watching a movie, and the BTU and airflow rates are both very generous for a product of its size and price. An air conditioner which works quickly and effectively to drop your temperature down to a manageable level in only an hour, and can also comfortably be moved around your home from room to room. The portability makes it a great option if you live in a flat or your home has several rooms so it can’t just be popped in one place and left to cool the whole building. It is incredibly powerful for the size at 2600W, so will work just as effectively as one twice the size which runs at 1000W. It can be set up to keep the temperature maintained for a long period of time, so if it gets to the perfect cooling level but then heats up again in 15 minutes, it will turn on to get it lower again. This is perfect if you want to use it overnight in your bedroom and not be disturbed by constantly having to get up and turn it on again. The noise is a little louder than with other models, probably due to the smaller size and bigger power output, but this could become a little too much for some people in a small bedroom overnight. Having said this, if you can get through it, then the notable difference in temperature levels makes it very much worthwhile. You just need to be able to pop the hose out of a window, so you don’t wake up to a flooded room. The first domestic air conditioning unit to achieve an A++ energy efficiency rating, this Pinguino model will run effectively without making too much of a dent in your energy bills. It is also a great improvement in technology compared to its predecessors. The climate light indicator gives the user a constant update on the conditions of the room via the LED display. There are also three light stages – orange for uncomfortable conditions, green for acceptable and blue for optimal. You can use this unit on dehumidify-mode only, making it versatile for whatever you need. Handles and castors also make it very easy to move around, despite it being on the heavier side. The included bio-silver filter will remove pollutants and allergens from the air, making it ideal for hayfever sufferers in the summer months. Low noise emissions are guaranteed even when it is on the maximum setting, so if you want to leave it running overnight, it will not disturb your sleep. The maximum cooling capacity is very high, so it won’t leave you struggling in the heat. It is the most expensive of our picks by far, but if an air conditioner is vital and you want the best of the bunch, then this is your top pick. The most innovative and advanced air conditioner in a long time. A must for those who rely on these appliances. This monoblock air conditioner from Trotec is compact and slimline for a product of its type, making it perfect if you want to fit it in any little niches out of eyesight. It is on the lightweight side, so can be transported between rooms with little effort using the four wheeling castors. There is also a handy little cable tidy and remote-control storage caddy so that you won’t lose any vital pieces on the way. 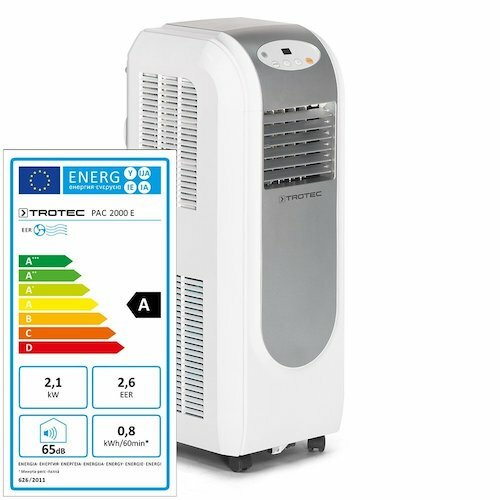 Not only does it have the ability to cool down a room up to 65m² to 16°C, but it can also be used as a dehumidifier or aerator without using the cooling function. The hose is 1.5m long, which is good for most rooms and placements. Relatively good output but not best if you are easily disturbed in your sleep by any noise. Download TROTEC PAC 2000 E Local Air Conditioner User Manual Here. This portable unit is not only small in size but fully flexible, with a duct which the user can fit to various window styles. With three modes to choose from (cool, fan only and dehumidify), the appliance can also be adjusted to suit your needs. 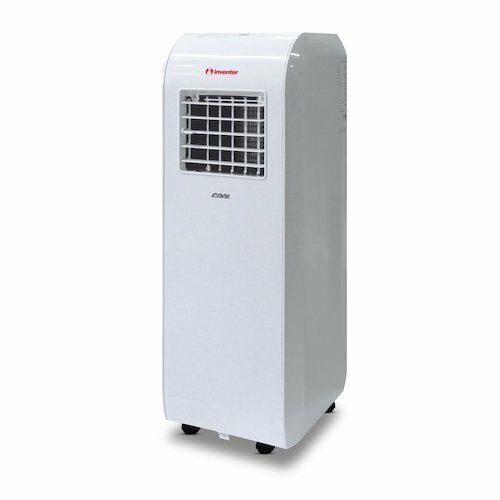 The former will act as a traditional air conditioner, reducing the temperature of the room and allowing you to choose your desired fan speed. The latter will perform at 0.75L/h. There is a drain tube to make emptying out any excess moisture easy, which the owner should perform periodically. Recycling warm air into cold air, the Challenge 5K provides enough power for a room size up to 7~10m². The self-evaporative system will draw excess moisture from the air, helping to keep the ideal temperature. Omni-directional castors make it easy to move between rooms, so you have complete freedom wherever you wish to spend your day. Controlling the appliance is made easy with an LED display, 1-hour timer function and remote. It is supplied with a 150cm hose, which should be long enough for most windows and external ventilation options. More expensive options may have more settings and be quieter, but this is great for a more affordable option. Download Challenge 5K Air Conditioning Unit User Manual Here. How Can I Find The Best Air Conditioner For Me? Finding the right unit for your needs will take in a lot of factors. How big is the room you will be aerating? Where will you be placing the air conditioner? How long does the hose have to be? Do you want the unit to be able to do anything else as well as remove heat? Some devices are better equipped to deal with larger rooms than others. Don’t just think about the main room the appliance will be in, especially if you are planning to take advantage of the fact it is transportable. 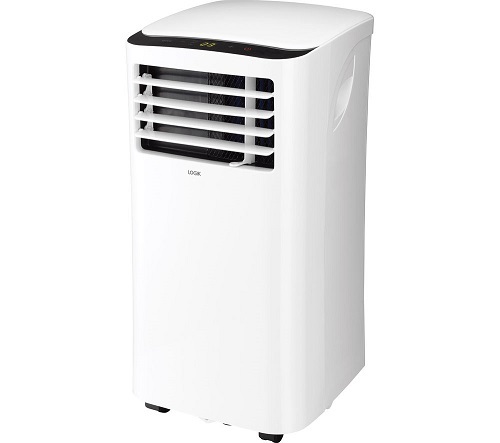 Most of the air conditioners featured are square in shape, but there are some which are more slimline and therefore taller. Think about where you will be placing the appliance. Do you mind it being visible? Consider the fact that it will have to be near both a plug socket and external ventilation, such as a window. Some air conditioners have an added benefit of also being able to act as dehumidifiers or lower the risk of allergens in your home. You will likely pay the price for these added extras, but they are great to consider if you are mindful of these factors. While they are expensive, it could be cheaper than buying two or three separate devices. Most air conditioners will have two or more different modes. These are commonly a selection of air conditioning, dehumidifying, fan only or heating. Think about what is best for your home, as purchasing an air conditioner which can do all of the above could save you having to invest in separate appliances and will be usable all year round. Why Do All Air Conditioners Need An Air Tube? Home air conditioning systems work more effectively than an ordinary fan appliance. This is because, rather than pushing warm air around the room, they expel the air through the hoses. So, while all of the air conditioners we have featured are portable, they require external ventilation. This can most commonly be through an open window or an air duct. Which Brands Make The Best Air Conditioners? Inventor, De’Longhi, VonHaus, Trotec and EcoAir are the five leading manufacturers of these appliances. Each brand offers a range of individual models, and it is best to assess what you are looking for in an air conditioner before you look into specific models. The output of every fan we have featured is in the form of British Thermal Units, or BTU. Essentially, this is a unit of measurement for energy. One BTU is the amount of energy used to lower the temperature of the room by one degree (in other words, the amount of heat removed from the room).